The fairway of the 15th hole at Slievenamon Golf Club, located at Lisronagh, between Clonmel and Fethard. 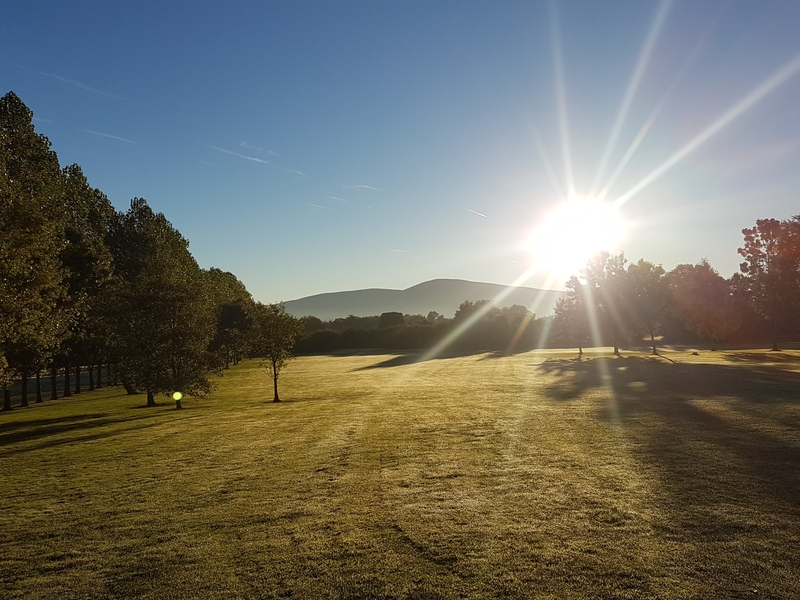 On the brink of closure in March of this year, with the existing owners announcing a cessation of upkeep, and members left in a limbo regarding their future, it seemed only a matter of months before the closure of Slievenamon Golf Club would be announced. However, at the proverbial 11th hour on March 31 a deal was struck between the Lalor family and the new owners, Dublin-based Brian Powell and Mary Hand, and with it the future of a golf club, which has been in existence since June 1999 and affiliated to the Golfing Union of Ireland, was secured. Brian, originally, from Clonmel, was prompted to the possible sale by fellow Clonmel man Michael Maher, a business associate over many years. It seemed the loyal club members also were in need of a white knight to come to their rescue. However, after weeks of discussion it still looked like the deal wasn’t going to materialise. Thankfully, the Lalors with Brian and Mary were given a ‘mulligan’ (a second chance, in golfing parlance) in regard to saving the venture and the rest is history. Recently I called to Slievenamon Golf Club to meet up with the new owners and see first-hand the redevelopment work that has been taking place since April of this year. One could not be but seriously impressed with the many many improvements that have been undertaken from 1st tee box to 18th green, and the course has now been transformed in many aspects into a much better round of golf that will greatly appeal to golfers into the future. It's a new dawn for the par 70 5,082 yards course at Slievenamon Golf Club. Besides their substantial initial investment where the new owners put their money were their mouths are to purchase the golf course, they have since also pumped significant funding into developing and shaping it into a course they think will greatly appeal to all golfers. For a start they have invested heavily in an array of state-of-the-art equipment to maintain the course to the highest standards. Head greenkeeper Paul Kenny and his assistants Matt Fleming and Michael Walsh can now go about their work in bringing the 18-hole course up to a standard never before seen at Slievenamon. Most of the work that is ongoing is being done under Paul’s experienced professional watch, the Fethard native having worked at a number of golf courses throughout Ireland in recent years gaining that experience. “It has been one hectic summer for us and most mornings we were here from 5am till late working hard at it. But it is really important to get this work done correctly from the start. You get one chance at it and we are doing it by the book to make sure it all works out as planned,” said Paul. Head greenkeeper at Slievenamon Golf Club, Paul Kenny. The work has included the construction of 16 new tee boxes, the redesign and re-laying of a number of greens, new bunkers, some major work thinning tree areas, the very imaginative re-shaping of a couple of holes and a general improvement in fairway maintenance and greens. The course improvement work also involved over 5,000 square metres of drainage — recently completed — across the top of the course. What will be a great addition also and currently under construction is a lake feature in front of the 14th green and 15th tee box. While the work has been settling in very well over the past few months, winter is now approaching and nature will take its deserved rest. But can spring be far behind ever? When it does return in 2019 it promises to do full justice to this major project. Only then will golfers be fully appreciative of all the improvements that have taken place at Slievenamon Golf Club since the change of ownership. The new joint-owner of Slievenamon Golf Club, Brian Powell, is literally leaving no stone unturned in helping to shape a golf course — and a golf club — into the future. Recently when I met with Brian he explained some of the owners’ plans for the future. “When we took over the club in March, the condition of the course was extremely poor. Lack of investment and the vagaries of the weather presented us with a course that was unkempt, overgrown and waterlogged. “This has all now changed, and the course has never been in better condition than it is today,” he added. “But we are not stopping here – there is still more work to be done, and we are putting the finishing touches to our planned schedule for next year, which will include the creation of a new water feature. “Our vision for Slievenamon Golf Club is to present a beautifully maintained course that is a challenge for all standards of golfer. It is not a long course but it does require golfers to manage their way around it if they want to score well. The greens are fast and true and relatively small, the fairways are well defined and maintained, the roughs are graded and fair and the emphasis is on presenting a course that is a pleasure to play where golfers will enjoy the spectacular scenery in a warm and friendly atmosphere,” he said. For Mary, a solicitor by profession, the allure of the club is personal. “My entire working life has centred around creating documentation and exchanging paperwork. Being an owner of Slievenamon Golf Club allows me to be involved in creating something real and substantial, and gives me a sense of belonging I have never felt before. The Members of the Club care about each other and about the Club. They are a remarkable group of people who support each other in times of trouble and joy, and I am so delighted to have got to know so many of them over the past number of months and to have been welcomed by them so warmly. Their generousity of spirit and openess is overwhelming. Brian and I are determined to meet that generousity in kind, and to do everything in our power to renew the Club’s ethos of respect, courtesy and compliance”. The Clubhouse, too, has seen major improvements. A brand-new office facility has been created and the locker rooms are in the course of being upgraded and renovated. Both the bar and banquet area and the Clubhouse Restaurant have been refurbished and are now re-open for business. A brightly lit fire is a constant fixture in the bar area, offering a warm and relaxing atmosphere for members and visitors, particularly as the winter evenings creep in. The bar is now open for soup and sandwiches daily, as well as tea, coffee and scones. The restaurant recently re-opened for Sunday lunch and under the dedicated direction of Jennifer Powell, offers an array of delicious food each week, in relaxed and convivial surroundings. Jennifer has also already successfully provided catering for a number of christenings, functions, family get-togethers and parties, and is now gearing up for impending Christmas functions. The Clubhouse Restaurant is an obvious destination for large parties, boasting ample parking at the front, while also being child friendly and offering full disabled access. The owners are delighted too that they have been in a position to provide local employment. Besides the on-course staff, there are five others involved in the office administration, Heather Bailey, Carol Molloy, Mary Butler, Cliodhna McGrath and Rachel Cahill, while Michael O’Meara takes care of clubhouse maintenance. What is unchanged and has remained a constant at Slievenamon is, most notably, the presence of Brendan Kenny at the helm as club secretary. While he is currently managing some health issues, Brendan’s enthusiasm for Slievenamon remains undiminished, and his prompt return to the club is eagerly awaited. 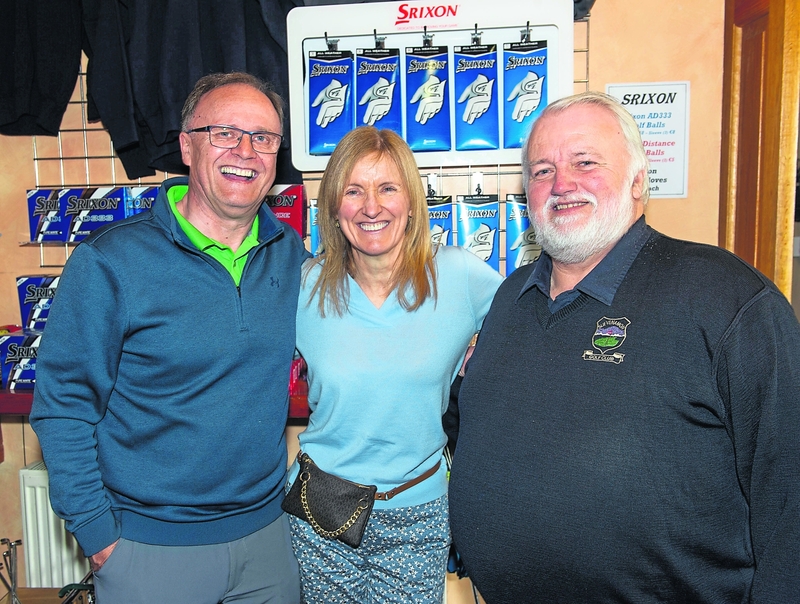 The new owners of Slievenamon Golf Club, Brian Powell and Mary Hand, pictured with Brendan Kenny, secretary of club since its opening in 1999. The new membership rates for 2019 have now been published. Starting from €300 p/a for new membership fees, the Club has a number of interesting and very competitive offerings, particularly to new members local to the Club, and all of which are available on its website and on contacting the office at 052 613 2213. “We are eager to welcome new members to the Club, and to welcome back former members”, says Brian Powell. “I think they are going to be overwhelmed when they see the condition of the Course and the huge changes that have been effected. It has been remarked of the Club in the past, but we truly believe now, that Slievenamon is "The Best Little Golf Club in Ireland."